Finally, a course for Facility Managers that addresses the challenges, difficulties and dilemmas of this demanding position! You'll learn how other facility managers at top organizations solve problems, deal with crises and handle complaints. 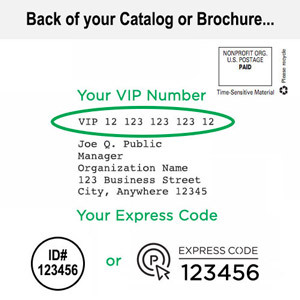 You'll learn how to put a plan for emergencies in place (remember the East Coast blackout in 2003?). And, you'll discover how to decrease your stress levels as you run your facility more efficiently - without killing yourself by putting in longer hours! 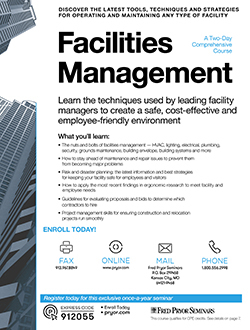 This course is based on "best practices" from top facilities managers around the country. Hundreds of hours of research, study, planning, and fine-tuning go into the production of each of our seminars. This one is no exception. Our course developers have looked at facility management in organizations across the country and analyzed their processes, systems and approaches. This workshop reflects the latest findings and best practices in facility management today and addresses the up-to-the-minute issues that make this field so difficult to stay on top of. You'll get tips, tools and strategies that are proven to work in real-world situations as you learn from case studies and other facility managers' experiences. This course is comprehensive, in-depth and packed with need-to-know information you can use the very next day you return to your office. Don't miss your chance to attend! Unlike many seminar leaders chosen for their speaking ability and communication skills alone, our speakers are proven experts in their fields. This means that your instructor has experience in facilities management and can share his or her knowledge and real life skills with you. Lively discussion, fascinating case studies, experiential activities, and more are all part of the process, and your trainer is skilled at using the latest adult learning techniques to ensure your grasp the most difficult concepts with ease. Get on board for two intensive days of hands-on, in-depth, need-it-now information - no boring lectures here!